Lisa Hemeon is a Toronto-based artist known for her abstracted waterscapes that feature glorious movement and unexpected colour. Hemeon’s work is marked by the rich layering of mediums which culminate in gestural waves punctuated by spontaneous drips and pops of colour. A theme of ‘undulation’ runs through each painting, as Hemeon works to represent the ebb and flow of our subconscious energy. The artist achieves this through applying multiple layers of emulsions, glazes and mediums. Hemeon feels that using this complex and laborious technique grants her the freedom to express herself, and in the process, she accesses deep memories and feelings. Viewers of the work tend to feel the same quiet energy radiating from each painting. The Once Upon Water residency with Artscape Gibraltar Point presents the opportunity and motivation to focus within and draw energy from a coastal environment. My project while at Gibraltar, is to work on a new diptych of two 40”x60” paintings on canvas. This time will be used to further investigate composition, colour and paint applications. The Once Upon a Water artistic residency would allow me concentrated time to connect and reflect on my continuing theme of “Undulation”. I would like to use the surrounding coastal environment as a conduit to creative inspiration, spontaneity and synergy. Lisa Hemeon moved from BC to immerse herself in Toronto’s creative production community. Lisa’s creative career path led her to manage award winning design, vfx and animation studios. This profession offered her the opportunity of working alongside highly talented creators and artists, whilst inspiring her own personal painting practice and art exhibitions. 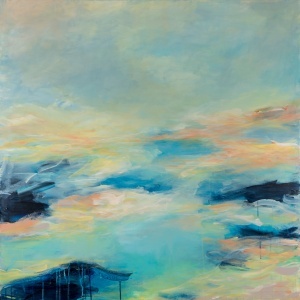 Growing up in coastal British Columbia deeply connected Hemeon to the intensity and motion of atmospheric coastal waters from which she continually draws upon to create paintings in her Toronto studio. Hemeon’s paintings are not literal or planned places, but represent an internal theme of “undulation” and shifting internal perceptions. These influences and interpretations allow her the freedom to express sensations with colour and texture, and the ability to feel memories just below the surface. Hemeon has exhibited her work in Toronto since 2002 and has been included in many private collections. Her works were recently published in British Vogue gallery pages March, April and May issues and London Lux magazine in Spring 2018.